This dress was NOT supposed to happen. You're probably scratching your heads and wondering "where's the dress??" 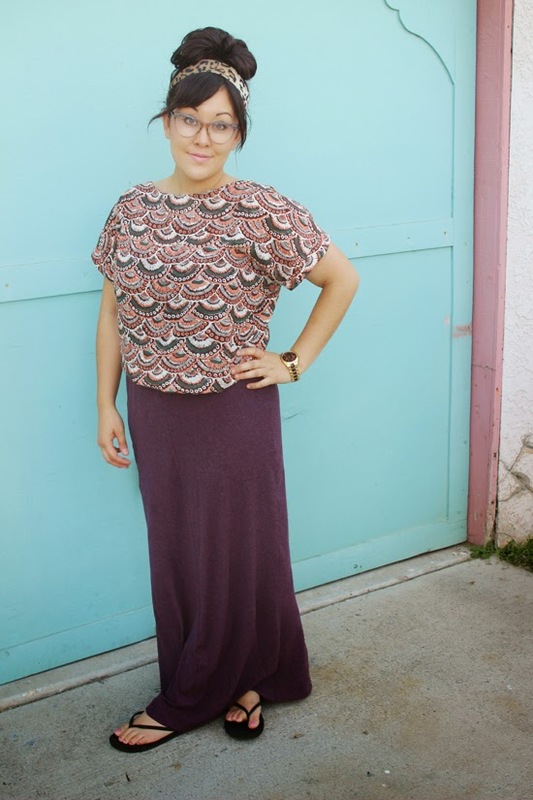 Yeah, this used to be a dress until I hacked it into a maxi skirt. I'm one of those people that insist on completing a garment no matter what. It could be my frugal side that doesn't like wasting money or time, or it could be the competitive side that doesn't want a project to get the best of me. Whatever the reason, I made a dress despite everything in the universe working against me and have ended up with a maxi skirt that I like when paired with my Salme Kimono top. 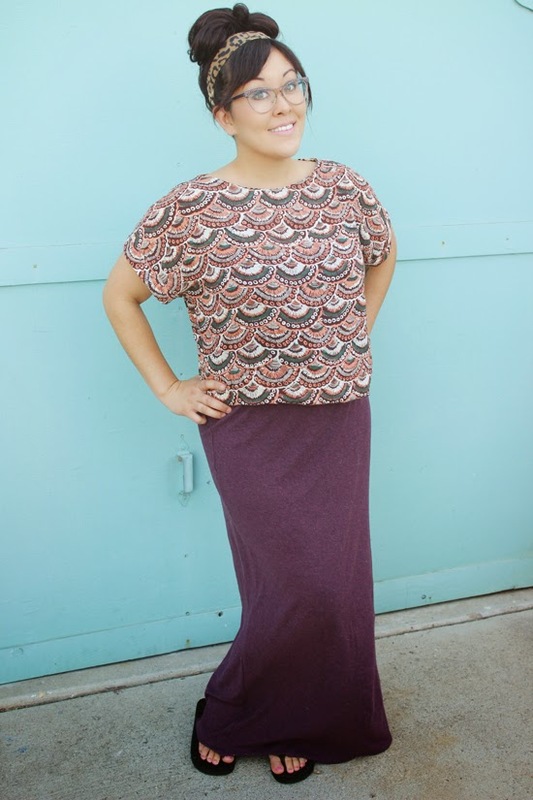 Let's go over the problems I encountered while making this maxi skirt. 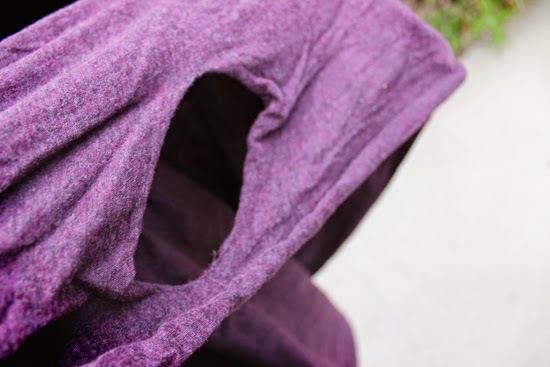 During the LA Blogger Meetup I was drawn to this pretty purple fabric from The Fabric Store. It was soft, 90% cotton, 10% wool, and from Japan (which made it instantly cooler in my eyes ;) ). When the girl at the counter was cutting the two yards necessary for the Style Arc Jacinta Dress I noticed that there was a huge hole. I'm not talking a dime sized hole, I'm talking a hole so big that I could dive through it into a pool. Ok, I'm exaggerating, but it was the biggest hole I have seen on a bolt of fabric. She cut off the flawed part, gave it to me for free, and then cut me a fresh two yards. Except, neither of us caught that the new piece had a huge hole in it too. Nooooooo!!!! There are only two versions for the Jacinta Dress, sleeveless and sleeves. Well, I mistook the pattern pieces marked with an "SL" to be for the version for sleeves. That was a dumb dumb move because apparently "SL" means sleeveless. It was annoying to have to recut fabric halfway into my project. And it was extra annoying when I cut the fabric on the wrong side which was slightly darker than the right side. And it was even more annoying that I didn't realize it until after I had sewn everything together. This little nightmare had me wishing for Sewaholic's organization when it comes to clearly noting which pattern pieces go with which version. Totally spaced on applying stay tape to the neckline and it completely stretched out. While sewing the center back seam I noticed the tension on my serger was way off. I literally spent hours trying to change the dials and settings to make it work. I referenced my Colette Patterns Guide to Sewing Knits, looked at videos online, and lurked around on blogs. None of the suggestions worked, so I figured that I could finish everything on my sewing machine. The tension was off on it too! This wasn't a surprise to me, since I had not had it serviced since I originally bought it. It's just a bummer when you are on a mission to sew and you can't! 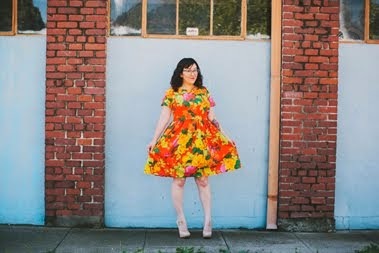 Once the sewing machine was returned to me I finished the dress and realized that it just didn't work. The neckline was way too big, the waist was a tiny bit too small, and the purple was just so blah for this particular dress. As you can see, after all that time and hassle I ended up with a maxi skirt that I could have made in an hour or so haha. I'm just glad that I could make it work and end up with something wearable. Sometimes you just need to get out the scissors, throw in an elastic waistband, call it a day, and go out for sushi with your friends. WOW - you definitely had some 'challenges' with that outfit!!! But for what you went through, doing what you did was the PERFECT solution! GOOD FOR YOU!!! Ack, how annoying! Glad you were able to power through and get something wearable out of a total debacle! Oh man, that sounds like a true Tim Gunn "make it work" moment! I'm glad you made it work though, because the purple color is gorgeous and the end product is really nice! I love your philosophy! Nothing wrong with an elastic waistband & way to go on rescuing the fabric! It looks great & I love the colour. What a bugger. But headaches aside, the skirt and color look great on you! How frustrating! But the skirt is really cute! And good job making lemonade out of lemons! At least you got a very wearable skirt, I threw away some lovely wool crepe when the dress I was trying to make went wonky. Good for saving the day! Oh you are darling. How really frustrating,. Been there. Done that. You have more patience than I do. I would have sworn loudly then tossed it in the waste basket after the second fail. Wear it in good health. Oh no! I gasped at the holes in the fabric, but what a great save, your skirt is lovely. Lynne. Well the skirt is gorgeous. I had a similar experience with my first version of the Flora pattern. The bodice just didn't work at all, and I realized the novelty print dinosaur fabric I used was just overpowering as a dress, but I like it as a skirt. That purple is really pretty and looks perfect with your blouse--good save. You're a babe! I have been there, many a times, with these mistakes. I have even accidentally put my 'fold' pattern pieces on the open end of my fabric. But, hey, you didn't waste it all! 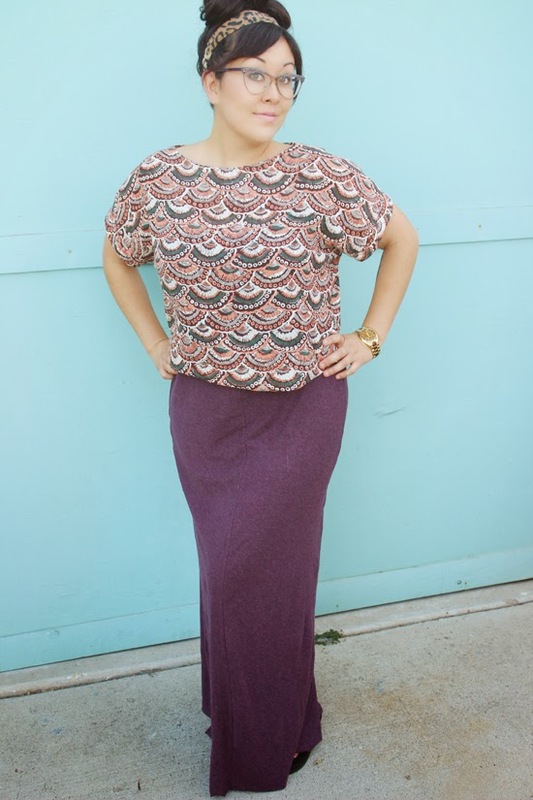 It makes for a great maxi! Looks so comfy. I made it into a circle skirt. :D I'll be posting it on my blog as soon as I get pictures. Thanks for the inspiration. I love the idea of taking something frustrating and remaking it into something easier.